Total mattress and box spring encasement for certified protection against bed bugs, allergens, dust mites, and pet dander. Ensemble includes KleenCover® Ultimate mattress encasement with matching box spring encasement. Total mattress and box spring encasement for certified protection against bed bugs, allergens, dust mites, and pet dander. 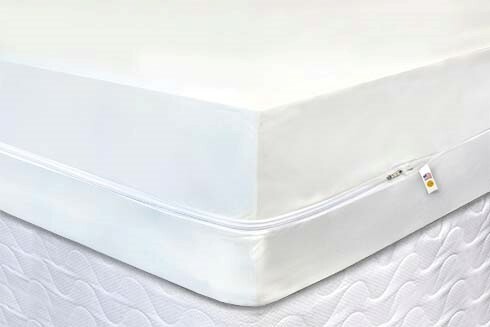 The KleenCover® Ultimate mattress encasement is made of comfortable and breathable stretch-knit polyester. Prevent bed bugs from infesting your mattress and box spring with this highly effective encasement. Used at the finest hotels and inns for bed bug control. Stretches to fit almost any mattress (up to 15" deep). 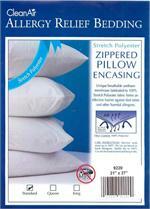 Total mattress encasement featuring the patented "Zipper with the Hook" closure. Unlike other covers, NO tape needed to secure or protect the zipper. This prevents new bed bugs, dust mites, and allergens from infesting the mattress. If you already have a mattress infestation, this cover will entrap the bed bugs, dust mites, and allergens to prevent future recurrences. Fully certified Bed Bug Protection to help provide you with peace of mind. Waterproof, breathable, and effective. Hot water wash with regular detergent and no bleach. Air fluff to dry or use medium heat permanent press cycle. Machine washable. Made in the U.S.A. The Bed Bug Solution™ Pillow Covers are bed bug, dust mite, and allergen impenetrable. After finding bed bugs on my 4 year olds bed, I was looking for a product that was easy to use, good quality, and affordable. We have 2 queen beds & 1 king bed in our home. When we had a pest control person come out, they quoted us so much money so I was determined to find something that fit our budget. I found this website and have been happy since. Ordering was easy! It took less then a week to get and the quality is wonderful! If I ever need to order any more covers, I will be back! Also, I have recomended these covers to EVERYONE I know even though they don't have bed bugs! Thank you!